Del Rey Books, 9780345548481, 332pp. Acclaimed author Kevin Hearne makes his hardcover debut with the new novel in his epic urban fantasy series starring the unforgettable Atticus O'Sullivan. For nearly two thousand years, only one Druid has walked the Earth--Atticus O'Sullivan, the Iron Druid, whose sharp wit and sharp sword have kept him alive as he's been pursued by a pantheon of hostile deities. Now he's got company. Atticus's apprentice Granuaile is at last a full Druid herself. What's more, Atticus has defrosted an archdruid long ago frozen in time, a father figure (of sorts) who now goes by the modern equivalent of his old Irish name: Owen Kennedy. Atticus takes pleasure in the role reversal, as the student is now the teacher. Between busting Atticus's chops and trying to fathom a cell phone, Owen must also learn English. For Atticus, the jury's still out on whether the wily old coot will be an asset in the epic battle with Norse god Loki--or merely a pain in the arse. But Atticus isn't the only one with daddy issues. Granuaile faces a great challenge: to exorcise a sorcerer's spirit that is possessing her father in India. Even with the help of the witch Laksha, Granuaile may be facing a crushing defeat. As the trio of Druids deals with pestilence-spreading demons, bacon-loving yeti, fierce flying foxes, and frenzied Fae, they're hoping that this time, three's a charm. "Uproariously entertaining in a way that Hearne is uniquely able to achieve . 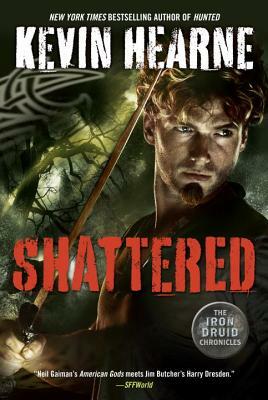 . . "Shattered"] has the feeling of a new beginning for its hero and for the series." --"RT Book Reviews"
"Clever, fast paced and a good escape." --Jason Weisberger, "Boing Boing"
" Kevin] Hearne is a terrific storyteller with a great snarky wit. . . . Neil Gaiman's "American Gods" meets Jim Butcher's Harry Dresden." --"SFFWorld"
"Celtic mythology and an ancient Druid with modern attitude mix it up in the Arizona desert in this witty new fantasy series." --Kelly Meding, author of "Tempest"
" Atticus is] a strong modern hero with a long history and the wit to survive in the twenty-first century. . . . A snappy narrative voice."" --Library Journal"," "on" Hounded"
"Outrageously fun."" --The Plain Dealer"," "on" Hounded"
"Superb . . . plenty of quips and zap-pow-bang fighting." --"Publishers Weekly" (starred review), on "Hounded. Kevin Hearne has been known to frolic unreservedly with dogs. He is probably frolicking "right now "and posing to his dog such timeless rhetorical classics as "Who's a good boy?" and "Who wants a snack?" He hugs trees, rocks out to old-school heavy metal, and still reads comic books. He lives with his wife and daughter in a wee, snug cottage.